I hooked up with the I.P. Ipswich Posse for a day of trail maintenance and general cleanup in Indian River Park on Sunday. The I.P. Ipswich Posse is a local extension of the Eastern Virginia Mountainbike Association. This cool crew of avid mountain bikers, their families, and other park enthusiasts from the neighborhood has adopted the park and are actively working to take care of this local gem. Twenty-two adults, along with several kids and a few dogs came out early Sunday for the cleanup event. 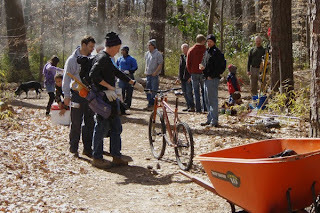 Splitting up into several teams, armed with rakes, clippers, shovels, and paintbrushes they fanned out across the park to collect trash and debris and fix up several bridges . One central focus was to clear brush and repaint the bridge over the park’s main stream. The waterway narrows here to a channel only a couple of feet wide, but it’s actually the main branch of the upland Indian River, the namesake for the park and the neighborhood. As the stream meanders through the park, the surrounding natural area acts as to slow and filter the runoff from the surrounding neighborhood. But today’s mission was to make sure this important crossing over the stream in the park stays in good repair. 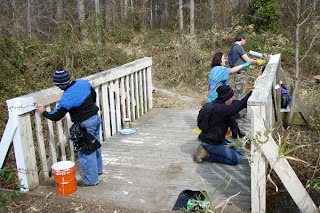 While a party stayed to work on the bridge, others split off in teams of two or three, some with wheel barrows, to walk the park's miles of trails in search of trash. A few areas seemed to be magnets for discarded water and beverage bottles but some of the more littered areas were right along the stream banks with debris washed in from the neighborhood. The volunteers picked up a few dozen bags of trash and several large items including a car tire, a shopping cart, large plywood board, and an ungainly shipping pallet. Although not on the main agenda, I also used my clippers to tackle some of the English ivy invading the park. While still limited to a few hot spots, invasives like English ivy and bamboo are another risk to the park. After long hours of work, the group gathered for a picnic of burgers and hot dogs to thank the volunteers for their efforts and socialize. The I.P Ipswich Posse is dedicated to keeping the area in good condition both for bicycle enthusiast and for the entire community. By sprucing up the park, it becomes more welcoming and becoming more popular for taking an afternoon walk or run. The park is a beautiful natural space full of birds and other wildlife. A few weeks ago I spotted a pileated woodpecker – our largest woodpecker – in the park. One of the other participants told me she has seen foxes in the park. Indian River Park has an extensive network of bike trails popular with area mountain bikers. Liz S., one of the coordinators for the day’s event told me that this is the only park with this kind of trail network on the Southside, which makes it very special to the group. After years of minimal attention from the City of Chesapeake, EVMA is now actively working with the City to improve the trails and maintenance of the park. The group can be found on Facebook and holds these cleanup events quarterly. I participated in the Great Backyard Bird Count this weekend, spending several hours on Friday and Saturday along the shores of the Indian River. It was glorious weather with temperatures near 70. It was low tide in the afternoon so I was able to walk along the impromptu beach. Over the two days, I spotted 19 bird species ranging from the tiny Carolina Chickadee to a graceful Brown Pelican coasting along the river. Unfortunately, I had my hands full with my binoculars and notepad, so I don't have a lot of great bird photos to share. But, there were many different birds. On the water were Canada Geese, Buffleheads, Mallards, a Canvasback, and even a Pied-billed Grebe - the first of that species I've ever recorded. 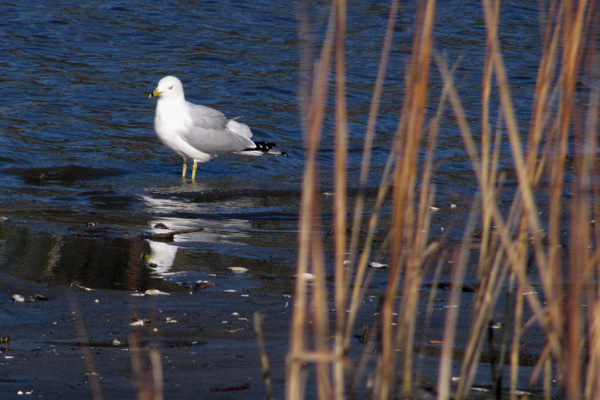 Ring-billed Gulls hunted along the tidal banks on the opposite shore. Overhead soared Black Vulture, numerous Crows, and at least two Red-tailed Hawks. Amongst the trees I picked out Mourning Doves, Blue Jays, Mockingbirds, Cardinals, White-throated Sparrows, and a Red-winged Blackbird. There was also a Kingfisher along the shoreline. While not sighted this weekend, a few days ago a Bald Eagle swooped a dozen yards over my head not a block away from the river. Its great to see this once endangered bird more frequently. Over the past several weeks I also sighted in the neighborhood Red-bellied Woodpeckers, a Yellow-rumped Warbler, Blue Herons, and our biggest woodpecker, the Pileated Woodpecker - the latter being at Indian River Park. Those bring my monthly total to 24 species. 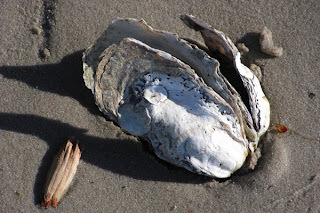 The inter-tidal stretch along the shore also had a fair number of Oysters, Mussels, and Clams - both empty shells and living specimens. Finding these is encouraging since they are filter feeders and as such they help improve the water quality. That the Oysters are surviving here makes this area a good candidate for additional Oyster Gardening. 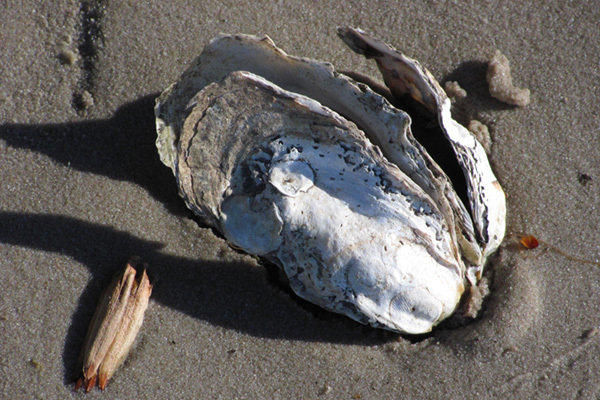 While it will still be many years before the water quality improves enough to make these shellfish safe to eat, every step of improvement helps. There was also a bit of trash along the shore, mostly litter washed into the river. 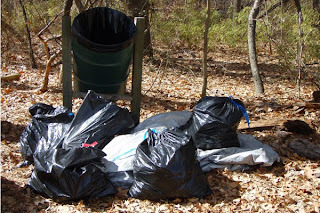 On my second foray I brought along a trash bag and was able to clean up about a hundred yards of shoreline. All in all, it was a thoroughly enjoyable couple of days. The numerous examples of wildlife was very encouraging and wets the appetite for continued improvement in the watershed. Update Sunday Feb 20: I didn't plan to do any more birding today but there was a figurative storm of birds around or near the bird feeder today. In 45 minutes I tallied 19 species including Mourning Dove, Red-bellied Woodpecker, Downy Woodpecker, Cardinals, Chickadees, Crow, Robins, Blue Jay, White-throated Sparrows, Mallards, Gulls, Cormorants, Canada Goose, Mockingbirds, Wood Thrush, Kingfisher, Brown-headed Cowbirds (boo! ), Red-winged Blackbirds (a flock of 100 swarmed the feeder), and a Ruby-crowned Kinglet (another first for me). That brought my weekend species count to 25 and monthly species count to 29.